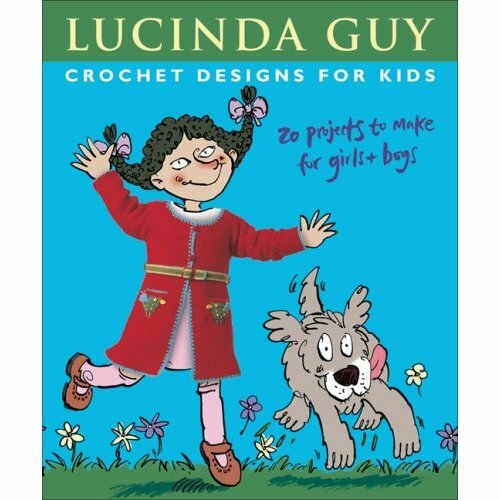 I ordered some more knitting books recently. I had gotten a gift card when we signed up for AT&T U-Verse (buyer beware, lots of glitches with this one). They make the gift cards almost impossible to use at a store, on purpose I am sure. It was getting close to the expiration date, and I finally bought myself an Amazon gift card lest I loose the AT&T value. So, I had some money sitting there, and bought my husband a couple of CD’s, and myself a couple of books. 2 came today. 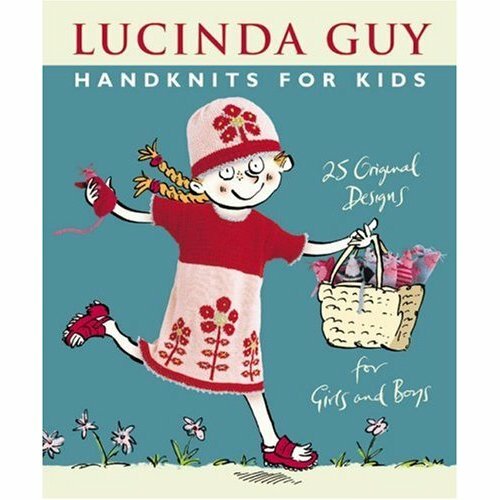 The one that I will focus on today is Lucinda Guy, Handknits for Kids, featuring Rowan Yarns. I originally saw this book years ago, and fell in love with the patterns, and more importantly the layout and “models”. A few years back, I had purchased the second book in this series, and already have this in my library. I learned the hard way to purchase books that I really like when I see them, as knitting books so quickly go out of print, and the runs are often very small. I have yet to make anything out of this book, but I love looking at the designs. 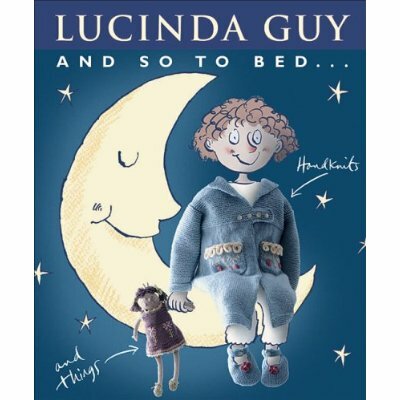 I love those books, they are so cute. Darn, so many patterns, so much yarn, so little time. I am busy working on the border to my shawl, which is interminably slow. So, I decided to post a link that was on a knitting blog Re Knitting that I read. 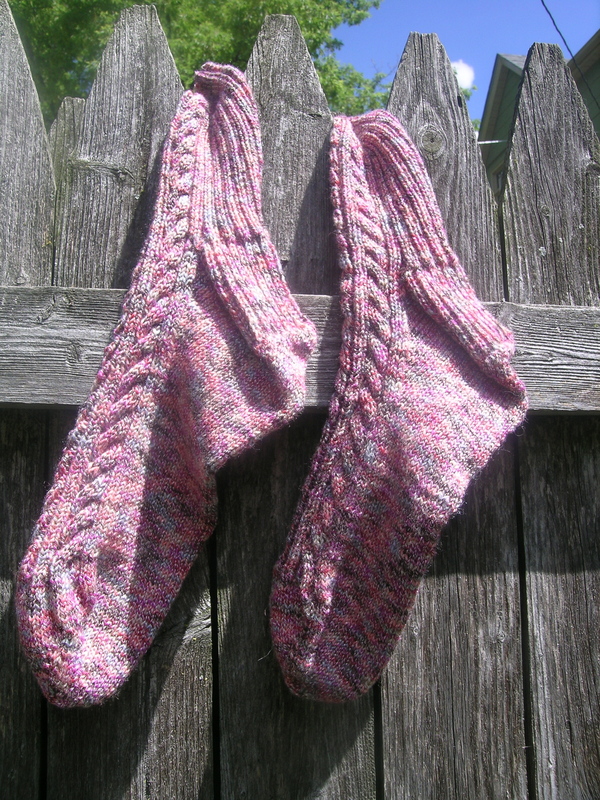 The author, Barbara, was posting about her knitting guild, which I am totally jealous of, but that is another story. 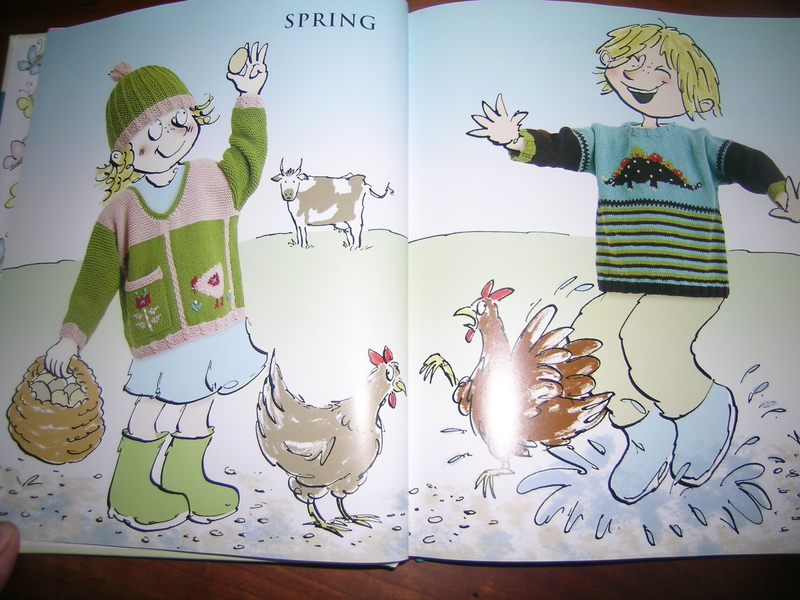 In it she talks about Illusion knitting, and links to the website by Woolly Thoughts. These people have really taken shadow knitting to a new level. 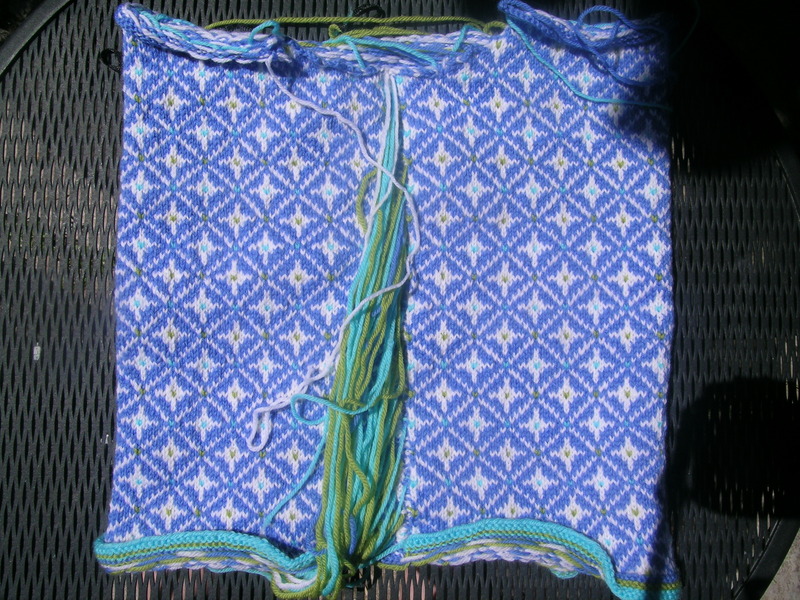 Shadow knitting, or Illusion Knitting, is the use of 2 different colors of yarn (contrast is better). “It is a process of knitting such that the finished piece has a hidden image only viewable from an angle. The effect is created by alternating rows of two colored yarns so that the raised stitches from one row block out the flat stitches of another row. 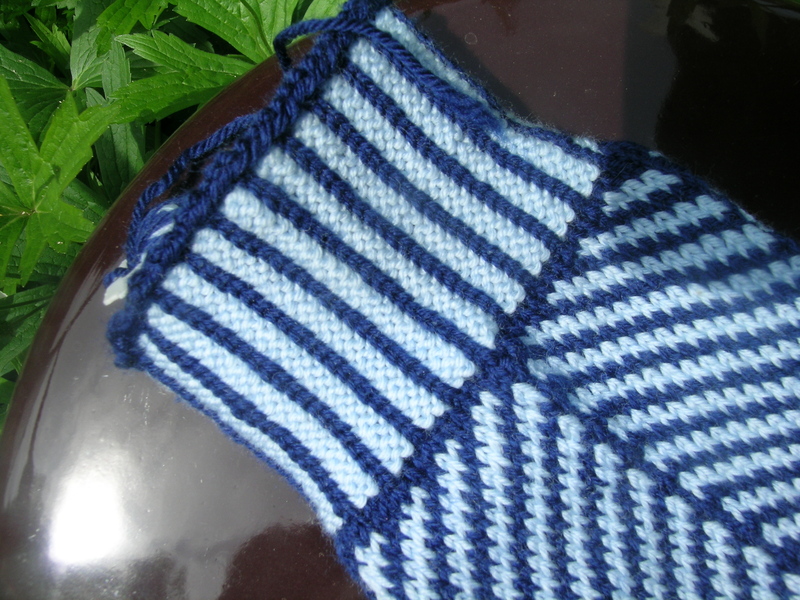 The finished work looks like a simple striped pattern from the front, but when viewed from an angle, the “hidden” image appears.” In essence you always knit on the right side, and either knit or purl on the back side depending on if you want the stitch to stand out (knit) or recede (purl). You work with 2 colors, but only one at a time, using that color for 2 rows. The trick is to just really follow the pattern well. 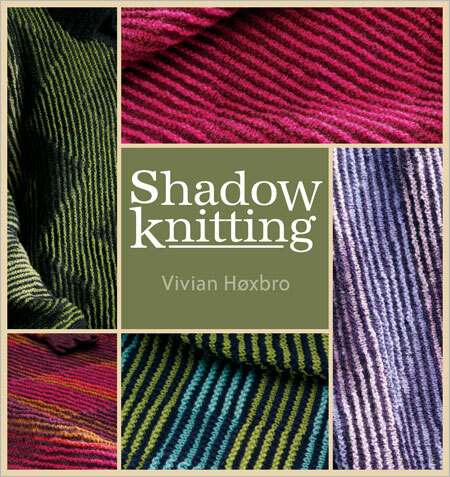 Vivian Hoxbro wrote a book on shadow knitting, and I made her large Wing Shawl using this technique, which I blogged abut earlier. I get lots of compliments when I wear that shawl. 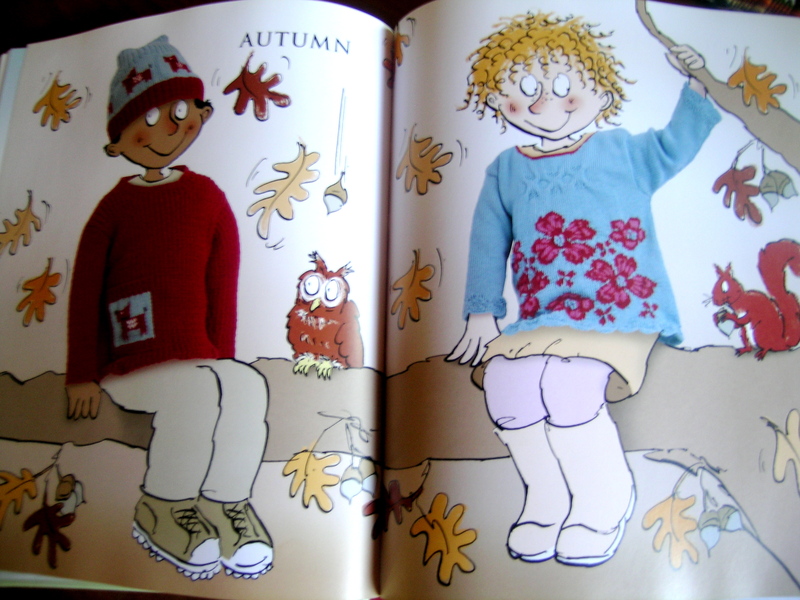 The people at Woolly Thoughts have taken it to an entire new level however, and really made it into art. Some of the patterns are free, and others are available for a nominal fee. I really want to tackle the tiger. Geez, I don’t know what was wrong with my Bloglines account – it never showed that you were posting, and then all at once, 70+ new entries showed up. Looks like I have a lot of catching up to do! That is a BEAUTIFUL Ravolympics sweater by the way. Thanks. Glad to have you back! Oh, don’t show me another book that I want! I love this technique and want that book now! 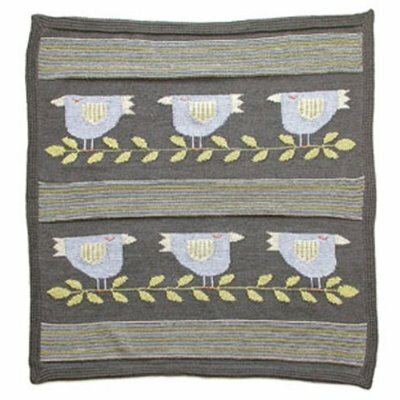 Beautiful shawl! Your work is so beautiful! I had put the irtfa’a faroese lace shawl on hold for many months now. The knitting of the body was fun and quick. But when I started to do the bind off edging I got frustrated and put it away. 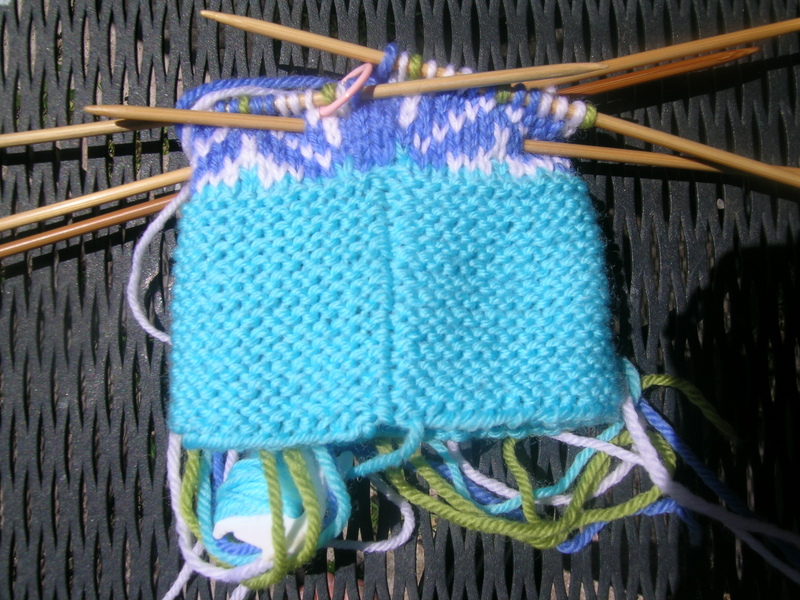 Most of the time when I do these knitted pattern bind-offs, there is a rhyme and reason to them and I am able to establish a rhythm to keep going. Not so with this one. I struggled many times to get the directions correct. I usually prefer to follow a chart, but for the bind off, found that the written instructions were “easier”. I have finally figured it out, but this will be a slow process, and one that I need to work on when I can concentrate. 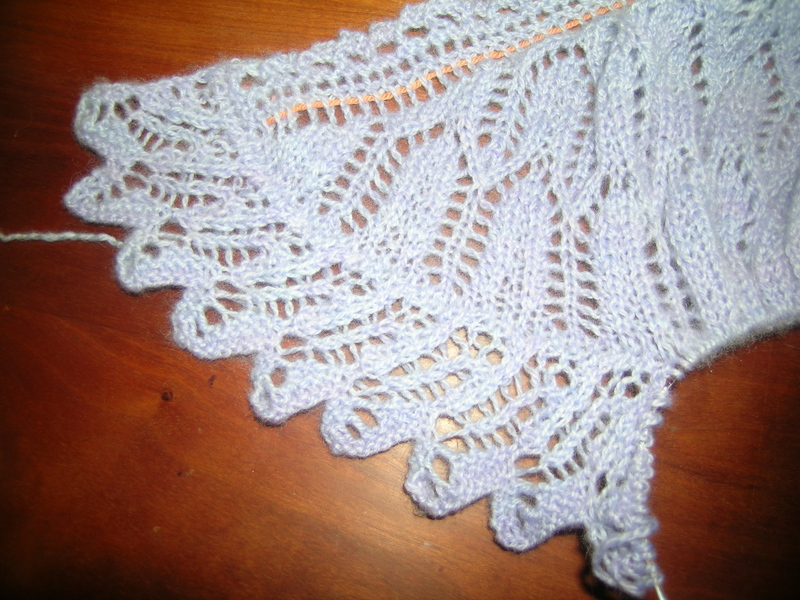 I also realized that I did not use a larger size needle for the main body of the shawl as instructed. I hope that this blocks out okay. It looks beautiful – well worth persevering with. Interweave Press is having it’s annual Hurt and Overstock Book Sale. 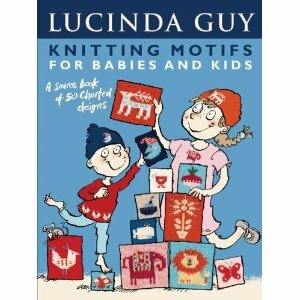 They have lots of craft books on most subjects, and 80 knitting books in the sale. Many are at 50% off or more. Check it out. I did and will post when my shipment arrives. 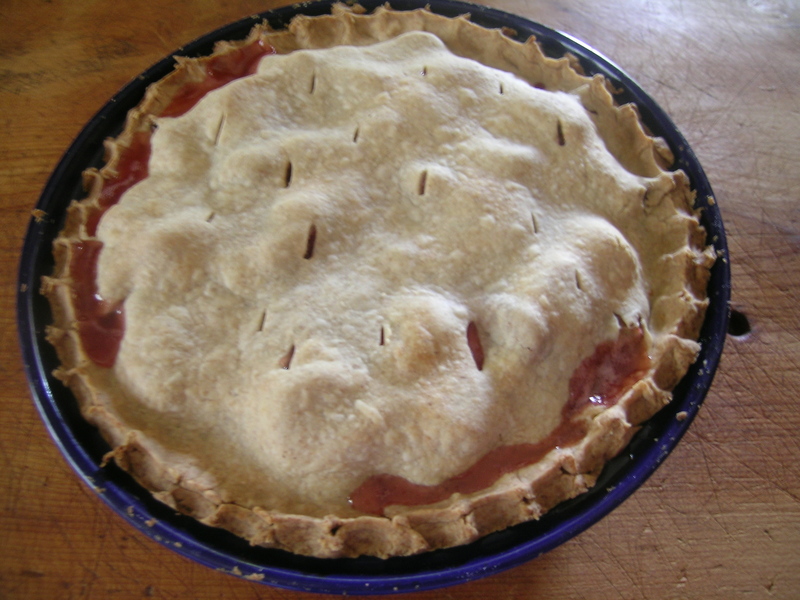 It is strawberry and rhubarb season, so that means PIE! My son has not asked for a cake for his birthday since he was 3, it has always been strawberry rhubarb pie. I made this yesterday, and will do another this afternoon. His birthday is next weekend, and I am not sure that we will be able to get these. It turned out great, even if I do say so myself. Who needs lunch, I think I will go have a piece a la mode. 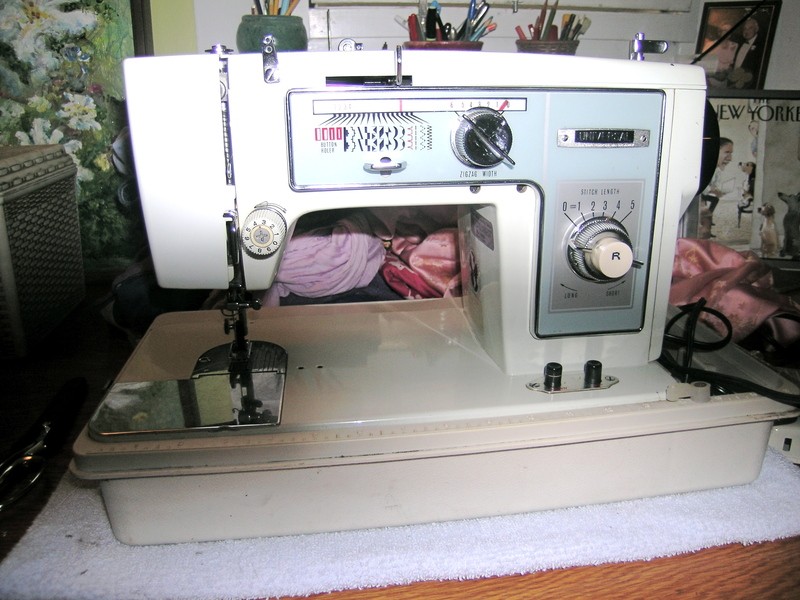 Using my newly repaired sewing machine, and I pulled out my serger. Doing some long neglected repairs, and then I will start a project. Mmmm… strawberry and rhubarb. Haven’t tried that. In Yorkshire we eat forced rhubarb, much earlier in the year, when it is pink and tender (they grow it in pitch dark sheds and pick it by candlelight). It’s world famous round here. But you don’t get strawberries then, of course. I improvised this pattern. Cast On 72 stitches, did a K2, P2 rib for about an inch, and then made 3 sets of cables that go down the leg and on the front of the foot to the toe. Each of the cables are 6 stitches wide, separated by P2, K2, P2. The cables are reversed on each sock so that they are either going towards one another or away when you wear them. The yarn is Regia Bamboo (45% bamboo, 40% wool, 15% polyamide), color is #1065 Passion. They are very soft and light weight. Good summer socks. I have finally finished the body to the Baby Coat. I hate doing Fair Isle on the purl rows. 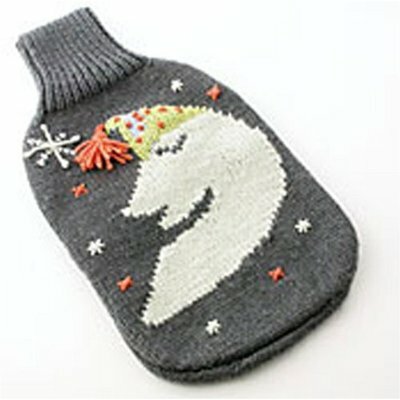 And this sweater has you carry 3 different colors every 6th row. I thought that I was so smart to plan that row with 3 colors to always be a knit row. Not so, but it probably worked out for the best, as the purl rows with Fair Isle are so difficult anyways, that I just had 2 colors on the knit row and could go faster there. This really is a coat, as the knitted fabric is very dense. It will be good with the hood and matching hat. Next, I started on the sleeves. They have a garter stitch cuff that is rolled up, and the pattern calls for it to be knit back and forth, and then joined in a round prior to starting the Fair Isle portion. That means more seaming, and on garter stitch, which I do not like. I found it much easier to knit in the round alternating a knit row with a purl row, and resulting in a garter stitch look, but no seam to sew, and it is very smooth. The other change that should be noted is that the pattern has you cast on an even number of stitches for the sleeves, but you are suppose to center a pattern stitch on the back. So I increased an extra stitch in the last row, and that way the sleeves are perfectly balanced at the increases, and it makes those easier to keep track of. When I finish knitting the sleeves for this sweater, I will sew and cut the steeks for this and the Zebra sweater that is waiting. It take such courage for me to do that, I would prefer more than one at a time. I do have to say that there must be something about this pattern, as I had a slight issue with dye lots AGAIN. Since Andrew is a colorist, I am going to fess up right now (but not rip back). 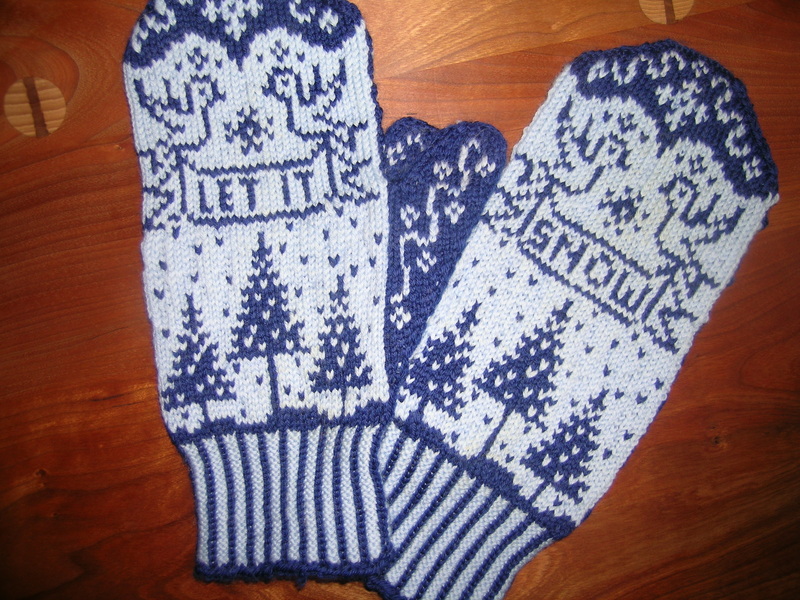 The thumb tips and the top of one mitten are a slightly different light blue. You would have to point it out to others, but the 2 of us would notice it right away. They is what they is. Enjoy. Yarn was Baby Ull by Dale of Norway. Machine washable, dry flat. Andrew’s mittens came out great & I am sure he loves them even with the tiny color difference that no one else can see lol. They rock great job. Oh my goodness. I hadn’t forgotten about them but I did not expect them now! I can’t wait to see them/wear them/show my mother that mine are better. Thank you thank you! They are beautiful. Those are darling!! Is there a pattern or did you just whip them up? I wish that I could take credit for just whipping these up. They were in the Fall 2008 Vogue Knitting magazine. Pattern is by Elli Stubenrauch. Very fun to make. I made these for my new baby niece, and gave them to her when we visited this past weekend. 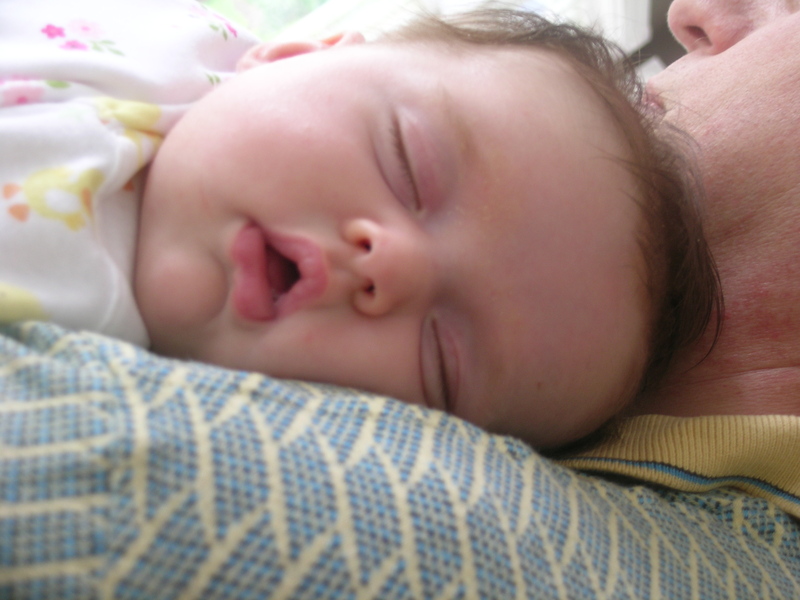 My husband was ecstatic, as he got to feed her a bottle at night, and hold her for her entire morning nap. He is definitely the baby person in our family. 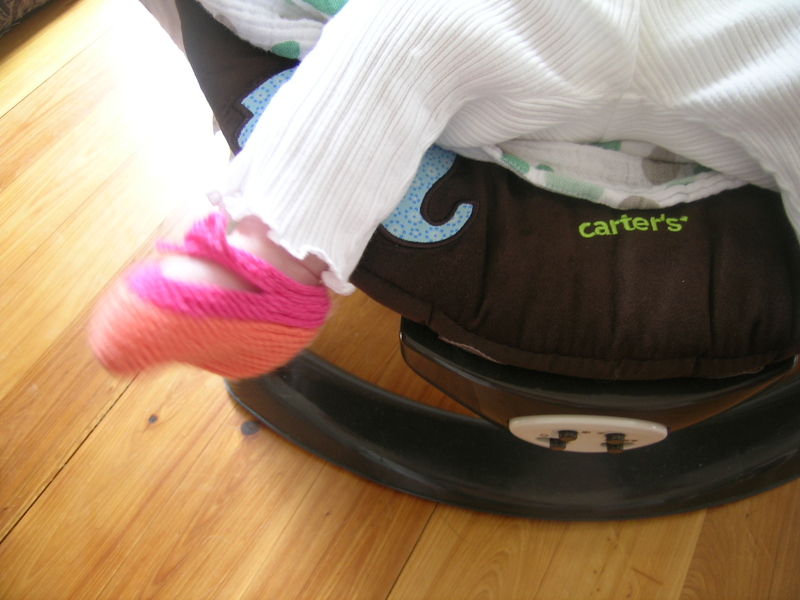 It was hard to get a photo of the booties close-up, as she was kicking so hard. 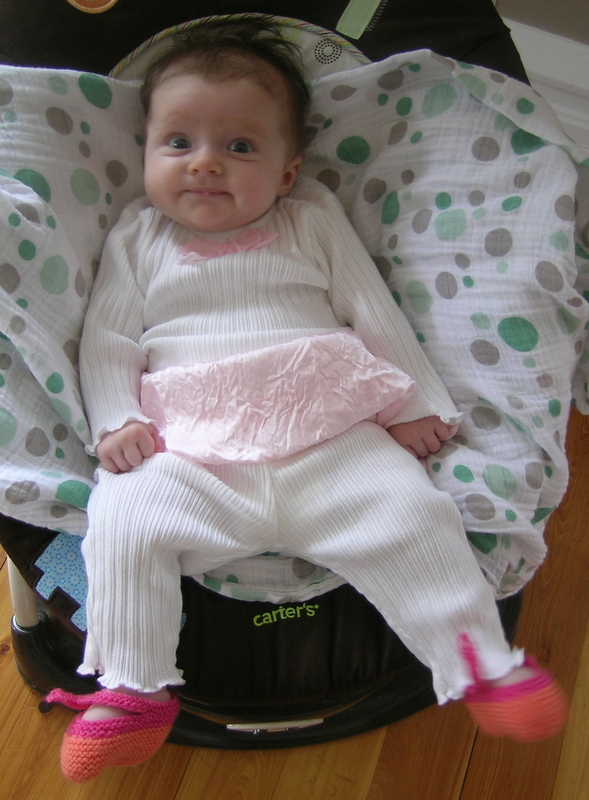 They are really cute ballet slippers, they just do not stay on the best.